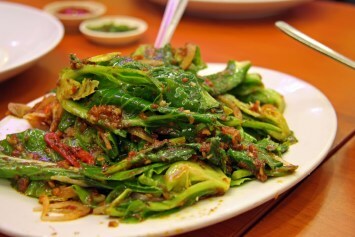 This is a fabulous greens recipe, done Chinese style. I call it a greens recipe rather than a kale recipe, bok choy recipe or chard recipe because you can use any of those, a mix of them or any other green you choose including Chinese cabbage. This is a simple stir fry that is loaded with flavor and nutrition. Take a look at the nutritional values in the blue chart on the right. Wash the greens thoroughly, shake off excess moisture and cut out the stems. Shred the leaves coarsely with a sharp knife. Heat the oil in a wok or large skillet. Add the garlic, mushrooms, red peppers and onions. Cook until the onion is slightly soft, then add the greens. Cook over medium heat, stirring occasionally, until the greens are wilted. Add the honey and soy sauce, cover and cook over low heat until the greens are tender, about 10 minutes for mustard or turnip greens, about 5 minutes for other greens. Each of the greens listed in the ingredients list above takes a slightly different time to cook. Kale for example takes a bit longer to cook than bok choy or Chinese cabbage. So adjust your cooking time accordingly and taste the final dish before you pronounce it “cooked”. You may not think the honey would work, but it adds a nice soft note of sweet to the dish. If you need this recipe to be gluten-free, please make sure the soy sauce you are using is gluten free. Some of them are not. This is such a great healthy vegetable recipe. You can use a variety of healthy greens and vary this recipe up as much as you like. It is a great gluten free recipe and makes a wonderful diabetic recipe too. If you are looking for new ideas about how to cook kale, this one is one to try. We sometimes don’t think of greens like kale, mustard greens, turnip greens or Swiss chard as vegetables to cook using Chinese flavorings. It really works though. I would serve this Chinese flavored side dish with so many things. Of course it would pair really well with other Chinese dishes, but it doesn’t have to go Chinese. How about serving it with grilled chicken, baked fish? Or serve this Chinese greens recipe with our brown rice casserole for a really healthy vegetarian meal. If you like this recipe, please take a moment to Pin it to Pinterest, Tweet about it, and Like it on Facebook. I would love to hear your comments about this recipe and your own favorite recipes. Please leave them using the form below below or use the Facebook comment box. Thanks a lot.